We are a not-for-profit corporation demonstrating a Scientific, Alchemical, and Mysterious understanding of Life helping people through our products and courses. This understanding is founded on sensed, intuited, or conscious contact with the Occidental Saints Angels Masters who guide, protect, bless, and overlight our lives; the Oriental Swamis Avatars Mahavatars who manipulate, instruct, direct, and oversee our lives; the union of Spirit And Matter which is life itself; the influences of the cosmic Sun And Moon, or constellations and planets, which qualify our lives; the interaction through Singles-Stereotypes-Spouses Ancestors-Ancients-Archetypes Monogamies-Matrimonies-Marriages who complement, balance, nurture and incarnate our lives; and the study of Science Anthropology Mystery where hue-mans form the bridge between fact and apparent fiction. The organization provides education and products for people using methods, which can help bring understanding of fundamental life processes through world service. Our name statement identifies, proportions, and organizes many objective and subjective influences in a person's life and offers ways of harmonizing, integrating, and cooperating with these influences. The organization is maintained on the premise of "Minimum But Sufficient" in all operations in order to support an orderly transition from Picean individual centralized mass lifestyles to Aquarian group decentralized interdependent lifestyles. SAM 2013 is a Primary Organization for the New Millennium that works with the concept of "Group". "Group" is a fertile field for realizations; a field where different plants grow harmoniously contributing their smells, colors and qualities. "Group" supplies earth, water, air, light, dark and equilibrium necessary so that life can multiply and come forth with the divine sound of creation. All of the SAM2013 products and methods are forms to bring the inspirations received relative to "Group" into material life. Conceived in 1973 by Spencer Anthony Marrese, the organization began it's quickening in 1980, went into labor in 1987 and was born in 1990 as SAM Things & Services. Prior to 1990 various consciousness-raising methods were integrated into a new method called 'Alpha Awareness', a method for exploring and expanding consciousness as a 'Beginningless Beginning'. Since 1990, various educational courses, products, and additional methods have been integrated into a holistic system of life process education to help people in life service. This was formally incorporated as SAM2013 in the year 2000 in Phoenix, Arizona. All income is used to support and expand the educational system, products, methods, and services of the organization and service projects. Click here for more information about the founders of SAM2013. Click here for more information about Relationship by the founders. Click here for more information about a Sufficient And Minimum life by the founders. The SAM2013 logo, which is made from 3 S's, 3 A's and 3 M's is a very important and universal symbol of creation in the integrated form of color, symbol, name, cycle, and message from the Seven Ray Lords of Creation in a personalized sense or which is a result of the Seven Ray Laws of Creation in the nonpersonal sense. 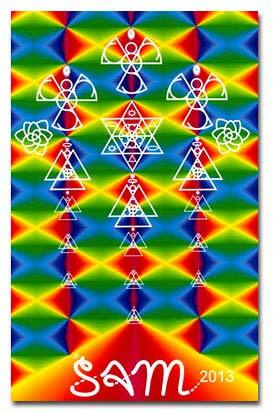 The Seven Rays of Creation do this through SAM2013 by using it as a manifested vehicle. The significance is that they apply SAM2013 to the new group processes of creation as an initiatory, yet organized and orderly process. They therefore help change the present individual and chaotic process of personal evolution into the new group and orderly process of group initiation through the SAM2013 symbol (as well as other vehicles of course). Saints Angels Masters level which has of course to do with human evolution, past, present, and future. The Sun And Moon, or astrological level, which has to do with the energies which qualify or color all life. The Spirit And Matter level, which is life itself—"Being," as it is sometimes called. Click here for information about licensing our symbol. In addition, SAM2013 Synthesis Color Trainings & Courses, Color Consultations along with the Synthesis Tri-level Color Card Deck can be found. The products and methods can be used in or on the body, subtle bodies or energy fields for helping initiate, increase, and maintain contact with these influences; clean, strengthen, or protect contact with these influences; or help the contacts with the influences function in more aligned, broad, useful, or higher ways as a spiritual experience. 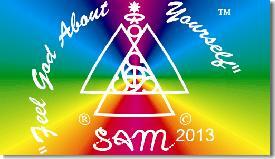 All of the SAM2013© products and methods are forms to help bring the true inspirations received into material life. The products and services are produced and used in service to the higher beings, which provide and help manifest their plans for this planet. The products and methods are meant to help people initiate and maintain a new or deeper spiritual awareness in their lives for these purposes. Various other products, courses and methods, in addition to those mentioned here, are produced and conducted on an ongoing basis and are described in other areas of this site or through contacting us. Soma Aura Monad - We Are SAM, SAM We Are. Soma - is the material and not-so-material "stuff" that we are made of. Aura - is the not so material and even less material "stuff" that we are and are not made of. Monad - is the pure shining timeless light that we are. These are the personal, communal, and universal elements that alchemically form SAM. The experiences gained by an individual who uses the products and methods can be viewed as points in time, not as a spectrum of life. With other experiences, from other points in time, the spectrum will then reveal itself as life, through these points, as light reveals the rainbow as it passes through drops (points) of rain. Please click here if you have any questions or inquiries about any of the SAM2013 products, services, consultations, or information that you see listed on this site. Information about our location and hours of operation can also be found here. 3. Contact us by telephone and a contribution can be made. 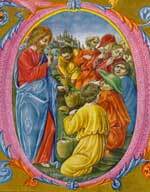 Oh Thou in Whom we live and move and have our being, the Power that can make all things new, turn to spiritual purposes the money in the world; touch the minds and hearts of humans everywhere so that they may give to the work of the Hierarchy (Saints Angels Masters) that which has hitherto been given to material satisfaction.